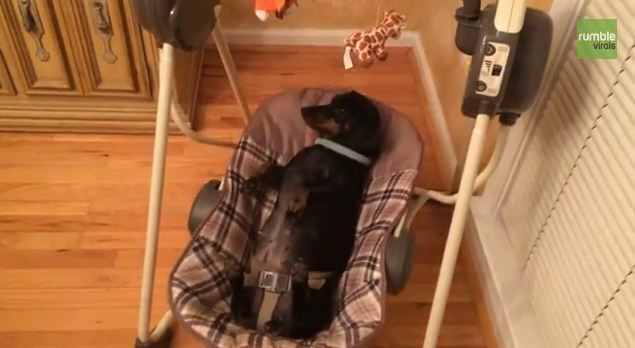 You may not know it, but there are perks to being a small dog… just ask this Dachshund! This silly little one is taking full advantage of his small stature by laying in an automatic baby swing! While the video is short, it sure is sweet! I’m not even sure you could get mad at her for doing something like this because she looks so gosh-darn adorable doing it! With the swing on and rocking, she’s showing the world what “relaxed” looks like! If you’re feeling stressed, this video should help relieve some of that for you. Sure, you can’t hop in the swing yourself, but you can at least get a chuckle at this cutie for doing so! Silly Dachshund! Gotta love their big personalities! So funny!! Can you believe he’s so laid back and “just chilling” there? We love it! Do you have a small pooch? We’d love to hear how your dog has taken advantage of his tiny stature lately! Share a funny story with us in the comments section below!